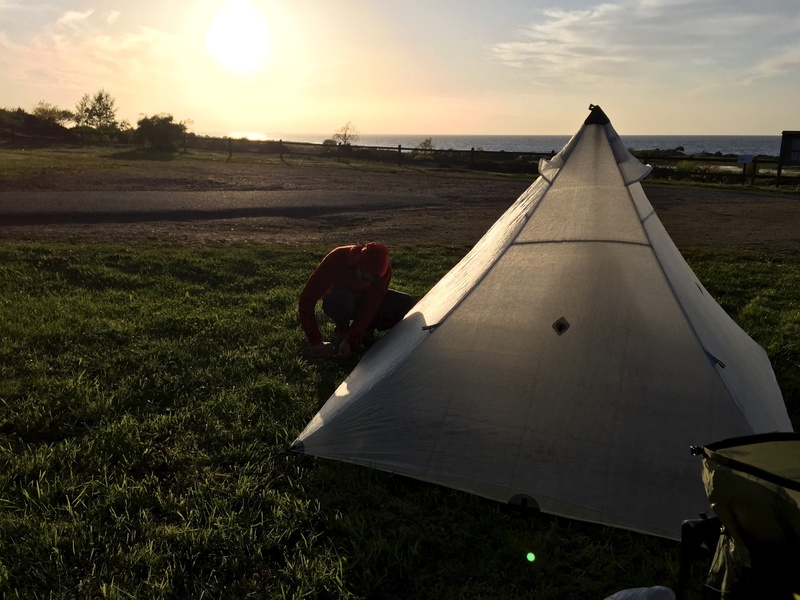 About a year ago I bought a inner for my Hyperlite Mountain Gear (HMG) UltaMid 2 tent. The first inner I received had the wrong specifications and the door opened inwards to the side so I had to return it to Bearpawwd, there were some miscommunication via e-mail. Anyhow I returned the first inner and received the right model for my tent, the Bearpawwd PyraNet 2 “Ultramid 2 modification”. Wrong version of the inner. Wrong size, much smaller and the opening is inwards to the side. After I received the right one I actually never picked it up out of the pouch that it came in… It has been stored in one of my gear boxes ever since. 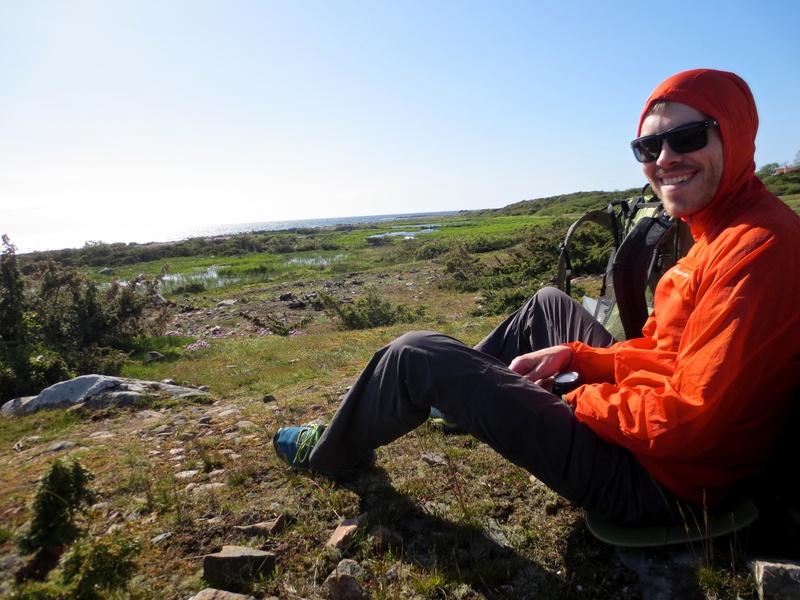 Now about a year later Jon and I decided that it might be good to bring it and test it out on our trip to Skåne and I’m glad we did because it was a really good inner! Staking out the UltaMid as the sun sets over Bjärehalvön. At the time when I was looking for a inner for my UltaMid 2 the market weren’t that big. There were a few different manufacturers but basically the only inner that had good specifications to fit the UltaMid without having too much dead space inside the tent was the PyraNet 2, “Ultramid-mod” (will refer only as PyraNet 2 in the text). Now a year later HMG has released their own inner for the UltaMids which are a little lighter than the PyraNet that I’ve got. Bearpawwd PyraNet 2 inside my HMG UltaMid 2 tent. The PyraNet 2 weighs in at about 730 grams compared to HMG’s equivalent at 595 grams. The HMG comes with a cuben fiber bathtub floor and I got the PyraNet 2 with a silnylon floor. If you want to be 135 grams lighter your wallet will also be 240 USD lighter excluding shipping. For me if I were to buy the inner now with both options available I think I’d still go for the Bearpawwd because I won’t be using the inner for every overnighter I do. Well maybe I’d get it with a cuben fiber floor instead, it would still be cheaper, and lighter. Regarding the silnylon floor… With our Therm-a-rest NeoAir X-Lite sleeping pads it’s like sleeping in an ice skating rink. Slipping and sliding all over the place! It can get cozy really fast if the ground isn’t level. I opted for the version with double zipper opening. Now in retrospect I could have gone with the standard full-right/left-opening with only one zipper. That would have shaved off a few grams. The inner packs away nicely in a small silnylon stuff sack. It also comes with a few meters of red paracord so that you can attach the inner directly to the tent without using any extra tent pegs. 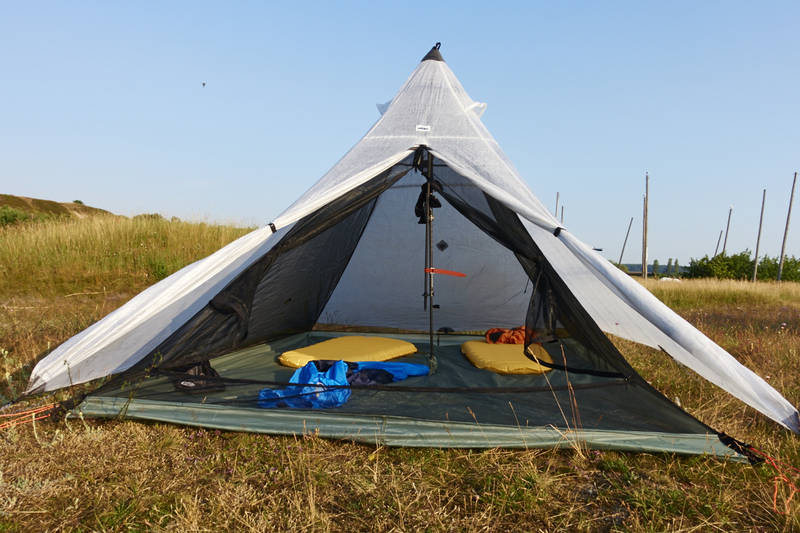 For this first test we used tent pegs, one in each corner, but in the future we’ll most likely only use the paracord as it’s more convenient and you can adjust the position of the inner more easily. One small modification will have to be done to the tent. If you look closely at the picture above you can see that the inner wall is a little saggy which steals a few centimeters of head room. 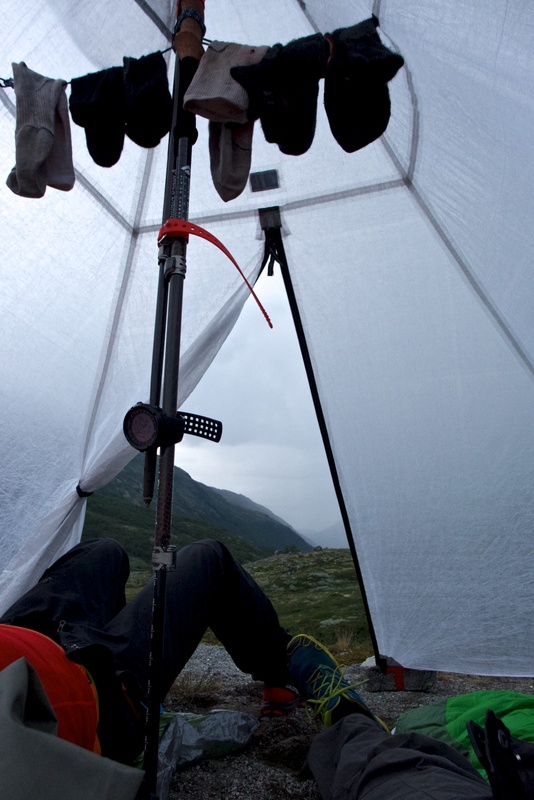 The solution to this would be to tape a small cord to the inner wall of the tent so that you can attach the inner to just like any double wall tent from say Fjällräven or Hilleberg. The inner actually has a small attachment buckle on the inner wall just for this purpose so no modification will have to be done there. *Updated 2015-07-12 – There was no real need for this modification after the supplied cords were attached with a little finness, see pictures below. Installed and ready. Added a glove hook to each strap so it attached easier to the guy line of the UltaMid. Easy to adjust and stretches the floor to the maximum. One drawback with using a inner is that you can’t use the loops inside the tent to make a makeshift clothes line for drying your socks overnight as we’ve done so many times before. All in all I’m very happy with my purchase and so far so good. 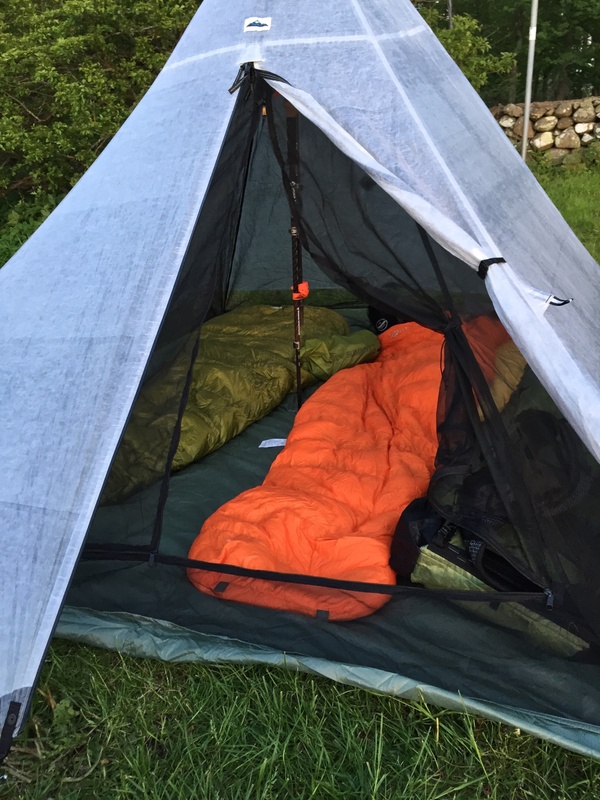 It fits perfectly with the UltaMid 2 so I can only recommend it if you’re in the market for a two person inner. I’ve heard rumors that HMG will be making a single person inner for their UltaMid-series so if you’re hiking alone that would be something to keep an eye out for.